With a $7 billion market cap, there’s a lot of interest in the Cardano project’s cryptocurrency, Ada. But what is Ada and how do you add it to your portfolio if PayPal is your only funding option? Our guide will help you buy Cardano with PayPal. What are Cardano and Ada? Vaporware or the Next Big Thing? Ada is the cryptocurrency that fuels the Cardano project. Driving Cardano’s development is cryptocurrency R&D company IOHK, run by Charles Hoskinson who also co-founded BitShares and Ethereum. Hoskinson and the other Cardano developers hope their “third generation” platform will displace Ethereum, BitShares and other smart contract platforms by addressing the earlier platforms’ weaknesses. Ethereum uses a Bitcoin-like proof of work system which does not scale sustainably as it relies on miners and their energy-hungry graphics processors. Cardano uses a proof-of-stake system, similar to BitShares’, that allows Ada holders to handle blockchain updates. The Cardano project claims that their proof of stake system, Ouroboros, is more secure since the Ada stakeholders are chosen randomly. All of this remains to be seen as Cardano is still in the early development stages. 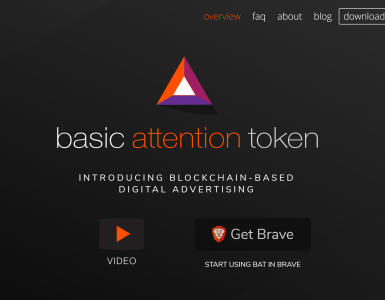 In fact, the only part of the project that’s complete is the ability to buy and trade Ada. The smart contracts system won’t be ready for at least 18 months. Bitcoin News included Cardano on its list of “Four Cryptocurrencies That Actually Meet the Definition of Vaporware”. The article’s criticisms are largely based on comments from a Cardano competitor. However, Bitcoin News does point out that Cardano’s $24 billion valuation seems like a stretch given how little of its development roadmap is complete. In his first-take review, blockchain scientist and The Bitcoin Podcast host Corey Petty pointed out that “people have jumped into something they don’t understand because the website looks good… the fact of the matter is that it doesn’t exist yet and hasn’t stood the test of time and usage.” At the same time, Petty admires Cardano’s underlying technology and the approach IOHK is taking. Cardano did make some real-world news in early May when it sealed a deal with the Ethiopian government. The Next Web reported that IOHK will train Ethiopians to develop blockchain-based agri-business applications using Cardano. You can’t fund your Ada purchase directly with PayPal because most cryptocurrency exchanges refuse to accept PayPal. Transferring crypto happens quickly and is irreversible. PayPal approvals take time to confirm. Even then, a less-than-honest buyer can challenge the transaction and PayPal will claw the money back from the exchange. The risks and costs to the exchanges are just too high. Instead, what you have to do is follow a two-step process. First, use one of the few PayPal-accepting services to buy Bitcoin. Then, use those Bitcoins on an exchange that lists Ada to buy your way into the Cordano community. If you have any other option, we recommend you use it. The fees and exchange rates are almost certain to be lower. If you don’t have a bank account and your credit history won’t let you get a credit card, then PayPal may be your only option. If so, read on to learn how to buy Cordano with PayPal. A peer-to-peer marketplace uses online ad listings to match Bitcoin buyers with Bitcoin sellers. They serve the same function as eBay or Etsy and work in much the same way. Ad listings let buyers search out the best deals for them. Rating systems let each side of the deal judge how much trust to place in the other. Unlike Etsy and eBay, peer-to-peer marketplaces like LocalBitcoins and Paxful add an extra level of trust through an escrow system. When a buyer and seller agree to deal, the seller’s Bitcoins go into an escrow wallet controlled by the marketplace. The coins only get released to the buyer once the payment goes through. This protects the seller from dishonest buyers. At the same time, escrow protects buyers since the seller can’t take the money and run. LocalBitcoins is one of the longest-lasting peer-to-peer marketplaces. It started as a way for Bitcoin enthusiasts in a given city to find each other and meet up to swap cash for coins. Today, most people in the LocalBitcoin community do their business purely online. Our article LocalBitcoins Review: No Frills Peer-to-Peer Bitcoin Trading provides a full run-down of the marketplace. Here’s a quick recap to help you get started. LocalBitcoins does not charge buyers for using its service. The marketplace makes its money from the sellers who must pay a fee for listing their offers. That doesn’t mean buy Bitcoins is completely free. Sellers will charge fees of their own and set exchange rates that offset the costs and risks of doing business. As PayPal is one of the riskiest payment methods, you can expect fiat-to-Bitcoin exchange rates much worse than what you see on the centralized exchanges. Once you’ve set up your LocalBitcoins account, simply select “PayPal” and enter the purchase amount on the Quick Buy form. At the time of writing this article, the search results in 15 listings with exchange rates start at $10,000 per Bitcoin. At the same time, Bitstamp quoted $8,745 per Bitcoin. Using PayPal on LocalBitcoin costs an extra 14%. The lowest-cost seller only has reviews from 6 people which may not inspire trust. The next seller up has a 100% rating from more than a thousand buyers and only costs a little more at $10,167 per Bitcoin. Getting that low price, however, isn’t guaranteed. You must be American or Venezuelan. In addition, you must verify your identity. Some sellers are less restrictive, but you will pay a price in higher exchange rates. Although Paxful has only been around a few years, the marketplace has a decent reputation as a place for reliable Bitcoin purchases. The setup is very similar to LocalBitcoin’s. If you want more detail, check out our article Paxful Review: Bitcoin Buying for the World’s Unbanked. Paxful also makes its money by charging sellers rather than buyers. 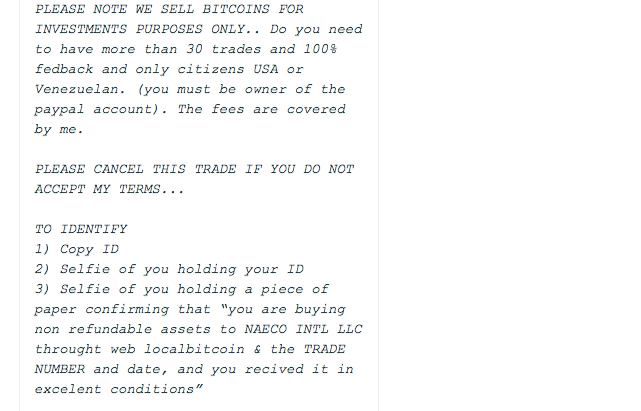 As with LocalBitcoins, the sellers often set exchange rates to cover their costs. Use the search form on Paxful’s home page to search for PayPal-based offers. This search produced 9 results with exchange rates starting at $10,204 per Bitcoin. 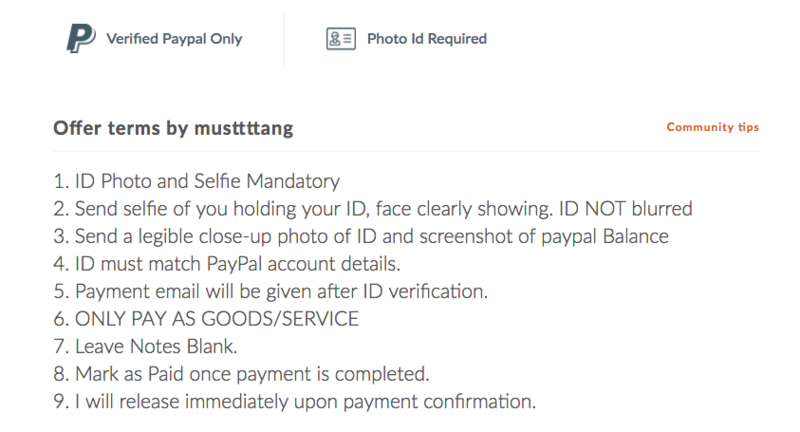 That lowest-cost offer requires that you be a verified PayPal user and that you provide proof of identity. As with LocalBitcoins, less restrictive offers will have even worse exchange rates. The peer-to-peer marketplaces require you to deal directly with people you don’t know. If that makes you uncomfortable, there are a couple of fringe services that let you make trades at arm’s length. VirWoX and Wirex, however, are more expensive and add additional steps to the process. VirWoX is a centralized exchange for the virtual currencies used in computer games and the online world of Second Life. It also happens to support Bitcoin trades. The only catch: you can’t buy Bitcoin directly. You must first buy Lindens, the Second Life virtual currency, and then use those Lindens to buy Bitcoins. We’ll highlight the main points here, but our article VirWox Review: Still Relevant Because of PayPal Funding Option provides more details. You must pay VirWoX fees at several stages as you move from PayPal to Bitcoin. VirWoX passes on the merchant fee it gets charged by PayPal. That amount varies, but may be somewhere around 3.4%. 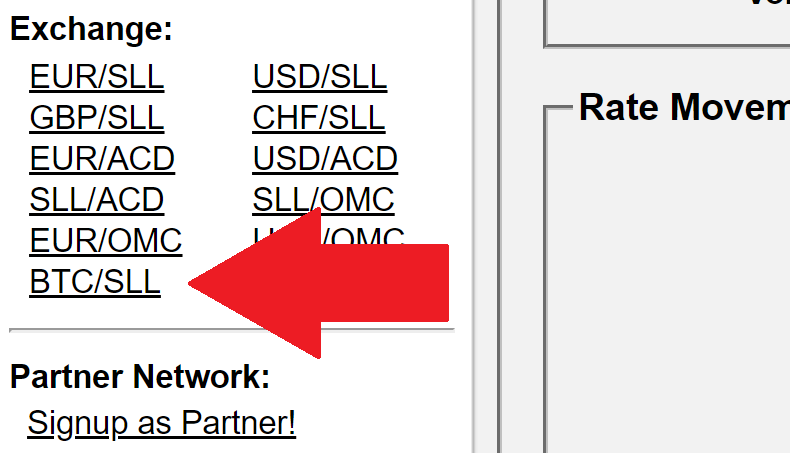 Next, you have to pay for the fiat-to-Linden exchange. Converting US dollars to Lindens costs 3.9% plus 50 Lindens. A euro-to-Linden exchange costs 2.9% plus 50 Lindens. You also must pay a 3.9% plus 50 Linden fee to convert those Lindens into Bitcoin. Finally, VirWoX charges a steep 0.0005-Bitcoin fee to withdraw your coins to your digital wallet. At the end of the day, using PayPal to buy Bitcoin through VirWoX will cost you about 12% of your original payment. 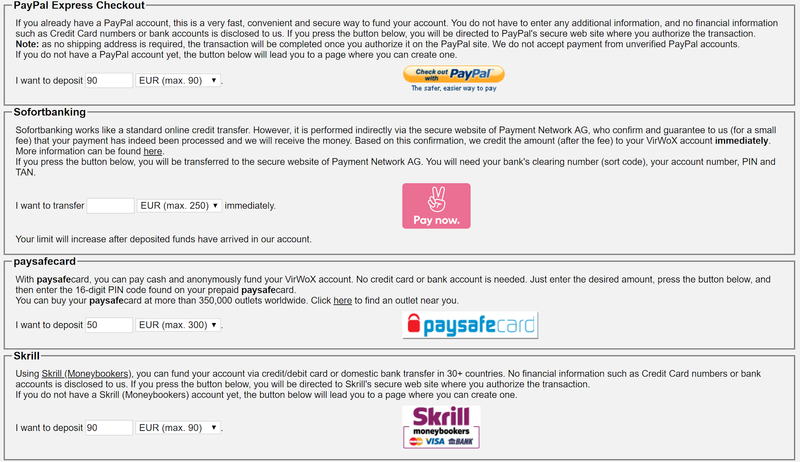 Use the Pay with PayPal button on VirWoX’s deposits page to start the payment process. 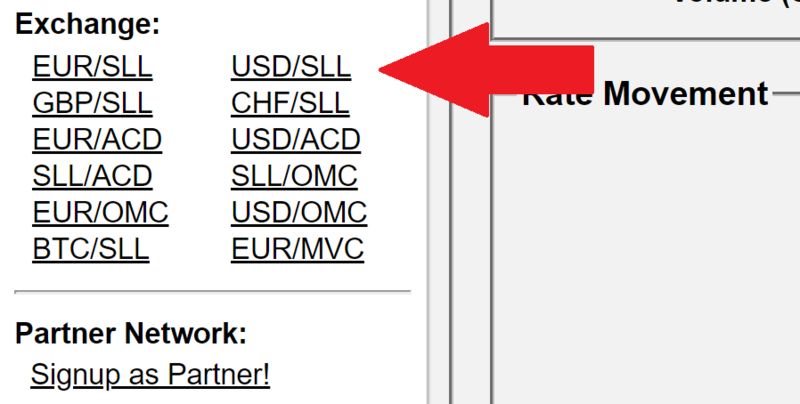 Next, you’ll use the USD/SLL or EUR/SLL option to convert your fiat into Lindens. Finally, you’ll use the BTC/SLL option to turn your Lindens into Bitcoins. Wirex built a reputation for providing debit cards linked to Bitcoin wallets. It was a great way to use your Bitcoin assets to make real-life purchases. That came to an end in 2018 when Wirex’s credit card issuer got banned by Visa. Wirex is still scrambling to bring its new issuer on board. Why does this matter? Because the process Wirex uses to accept PayPal requires a Wirex-branded debit card. Our article Wirex Review: a User Friendly Exchange with Low Fees and Crypto Debit Cards has the full details. Wirex could start issuing new cards any time now, so check their website to see if the following process is available to you. You will have to pay a monthly fee as well as fees for deposits and withdrawals. Exact details may change once the new issuer is on board. This whole process can take weeks the first time through. The Wirex identity verification process alone can take a week and a half to complete. 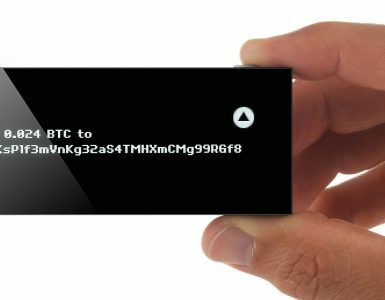 Then you have to sign up for the Wirex card, which can take several days. Finally, you must go into your PayPal account and link the Wirex card. That will let you transfer funds to the card — a process that can take several more days to complete. Once you have Bitcoin in your digital wallet, you can take them to a few exchanges that trade in Ada, Cardano’s cryptocurrency. Seattle-based Bittrex was founded by veteran developers from Microsoft and Amazon. They developed a scalable, high-performance trading platform using a cloud-first approach rather than relying on company-owned servers. With more than 190 coins listed and a well-connected executive team, Bittrex quickly developed a strong following among crypto traders. You can learn more in our detailed Bittrex review. Deposits and withdrawals are free, but you will have to pay a 0.25% transaction fee to convert your Bitcoin into Ada. Bittrex’s fees are at the high end for centralized exchanges, but that won’t matter if you’re only making a single transaction. High-volume traders, on the other hand, may prefer exchanges where they can get volume discounts. Bittrex users can place their orders directly from the BTC/Ada market page. The Malta-based exchange Binance has been around for less than a year, but now generates more than $1.5 billion in daily cryptocurrency trading. 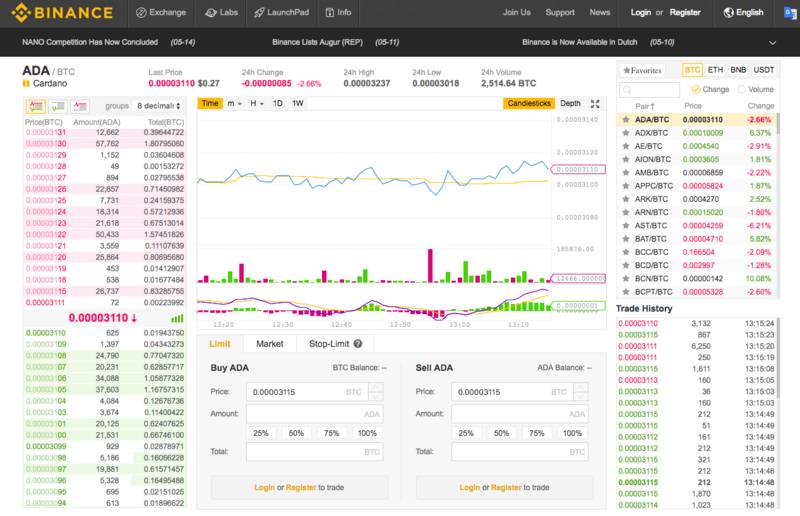 Ada is one of more than 110 coins and tokens Binance lists. You don’t have to pay anything other than the mining fees to move your coins into and out of Binance. You will need to pay a fairly low 0.1% trading fee to convert Bitcoins into Ada. Our Binance review has details on ways Binance traders can get even lower trading fees. The BTC/Ada market page has a form where you can place your order directly. 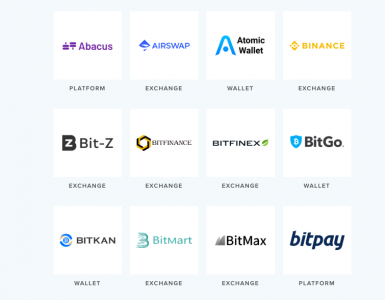 If you don’t have any other choice than to use PayPal, then your best bet is to go through one of the peer-to-peer marketplaces to buy Bitcoin and then use Bittrex or Binance to make the trade into Ada.